The Testing Center at Texas A&M-San Antonio provides a wide-range of testing services for the university and surrounding community. Texas A&M University-San Antonio Testing Center is now an open testing site for TSI. 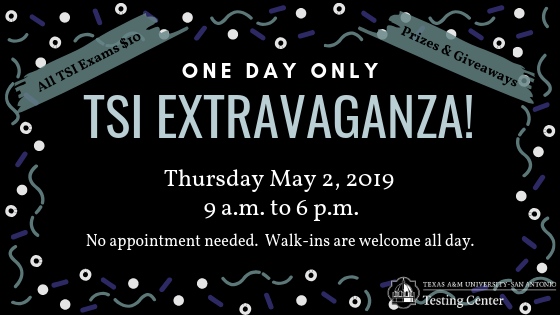 For more information, please visit our TSI Website. Just as a reminder, the Testing Center follows all our testing agencies policies and will not allow jackets, coats, hoodies, large outwear, etc. in the testing rooms. Please plan accordingly and dress appropriately. If you need additional information or instructions, refer to your exam acknowledgement. Payments are now made through the registration system when you schedule your exam. If you had already scheduled and have not paid for your exam, please refer to your confirmation email to pay. Students must register themselves for their exams. Faculty please do not register for exam dates on behalf of your students. Please call for testing availability or check the online scheduling system. The mission of the Testing Center is to advance the academic mission of Texas A&M University-San Antonio by facilitating students' educational, personal, social, and cultural development in order to promote their success and persistence in the university. We are committed to fostering a positive campus climate by promoting mutual respect and supporting diversity within our community. To achieve this mission, the Testing Center provides a broad array of testing services to assist students in achieving their educational, vocational, and personal goals. In addition, the Testing Center strives to reach out to the community by providing testing services to students, graduates, faculty members, professionals, and those from the surrounding area. The services provided by the Testing Center are based on the guidelines developed by the National College of Testing Association's Professional Standards and Guidelines. Please arrive 15 to 20 minutes early. Examinees that do not arrive early will be turned away. 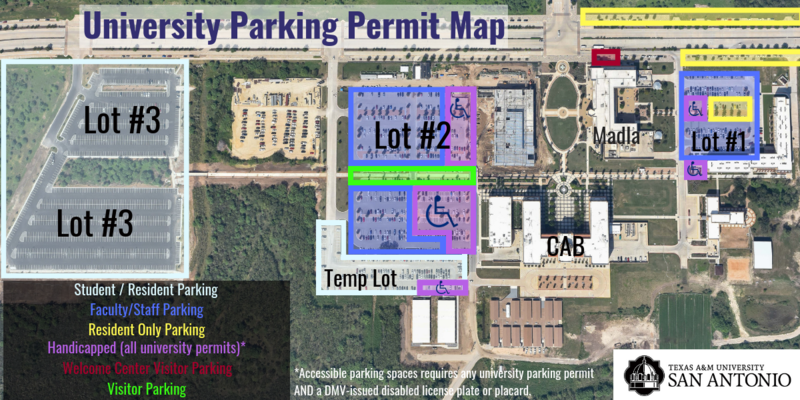 If you are not familiar with the Texas A&M-San Antonio campus, please click here for map and parking information. For ALL exams you will be asked to present a valid photo ID, make sure you have the appropriate type of ID for the exam you are taking. A valid driver’s license, government issued ID, or passport will always work. Some exams require a secondary ID. Know the requirements of the exam you are taking BEFORE you arrive. If you have questions about your ID, contact the testing company or the Testing Center well in advance of your scheduled exam. For security reasons, you will be asked to place ALL personal items (including coats, jackets, large hoodies, electronic devices, papers, books, etc.) in a locker and you will not be able to access them during testing.